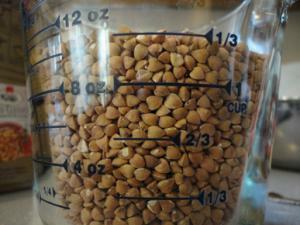 December’s Grain of the Month is Buckwheat. As most of North America, Europe, and Asia begin to bundle up daily in order to traverse the cold winter months outside, nothing comforts and cheers quite like this hearty, nutty, and versatile grain. Common buckwheat (Fagopyrum esculentum) is a pseudo-cereal crop that produces short, wide-spreading plants bearing bright green, heart-shaped leaves and small white ﬂowers. Although it may seem a bit odd to end our Grain of the Month adventure with a pseudo-cereal like buckwheat, it has played an important role in diets around the world, mainly in Asia and Eastern Europe. Buckwheat has been providing essential nutrients, vitamins, energy, and ﬁber to humanity for approximately 8,000 years. Its ﬁrst starring role as a cultivated crop appears circa 4000 B.C. in the Balkan region of Europe, but it’s thought to have truly taken hold inland in Southeast Asia and from there spread to Central Asia, Tibet, the Middle East, and Europe. There are accounts that Japan’s Emperor Gensho ordered buckwheat cultivation throughout the entire country to prepare for dry weather in 722. Here in the U.S., buckwheat ﬁrst hitched a ride with European colonists and, since that time, can be found growing in just about every corner of the globe. In fact, some early American crop yields are recorded by Dr. Jonathan Pireria in his book A Treatise on Food and Diet, published in New York in 1843 – complete with a recipe for buckwheat cakes! Even before assessing the importance of buckwheat groats themselves, buckwheat has proved itself to be a valuable crop in the ﬁelds. As a short-season crop that performs well in acidic and under-fertilized soil, buckwheat can perform as a “smother” crop, used to keep weeds at bay, and to keep soil erosion to a minimum while ﬁelds “rest” during crop rotation. 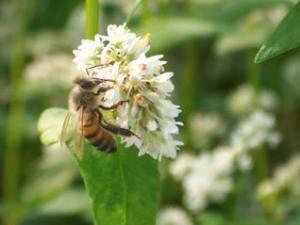 It performs best when sown in June, and because it blooms for quite a while (even into September), its nectar provides for late-season honey that can be dark amber in color and rich in ﬂavor. Once the ﬂowers have yielded buckwheat groats and it’s time to harvest, the plant stalks can be dried further and used as straw for livestock, or the entire plants can be tilled under to help next year’s soil retain more moisture. As a grain, it more than makes up for its less-than-striking appearance as a plant. Buckwheat groats are shaped almost like a pyramid, or a triangle with a rounded bottom and gently tapered sides. This unusual seed shape is actually how buckwheat got its common name, something that had been a point of no small discussion and debate at WGC Headquarters. Buckwheat is neither a relative of wheat nor a grain popular with bucks, but rather, its seeds so closely resemble the much-larger seeds of the beech tree that the plant has been called “beech wheat,” or buckwheat, ever since. If the shape of these grains in all their un-grain-like wonder doesn’t surprise, try this one on for size: Buckwheat has a gene that lets it make red or green immature fruit, but the hull of common buckwheat becomes dark brown or almost black as the seeds reach maturity and are ready to harvest. Click here to see photos of buckwheat in all its various forms. Buckwheat contains higher levels of zinc, copper, and manganese than other cereal grains, and the bioavailability of zinc, copper, and potassium from buckwheat is also quite high. Potassium helps to maintain the water and acid balance in blood and tissue cells, zinc helps to bolster the immune system, and copper deﬁciency leads to a number of really scary-sounding neurodegenerative diseases and disorders with terrifyingly long names. Bottom line? Having buckwheat in your diet can help you stay ﬁt, nimble, and healthy. Buckwheat also provides a very high level of protein, second highest only to oats. Not only is buckwheat protein well-balanced and rich in lysine, its amino acid score is 100, which is one of the highest amino acid scores among plant sources as well. Before you pin a gold star on buckwheat for its perfect test score, it’s important to note there is some evidence that the protein digestibility in humans can be somewhat low. While this makes it a less than ideal source of protein for growing children or anyone with digestive tract issues, it’s perfectly ﬁne for the grown-ups of the world. Besides, humans are meant to have a varied, omnivorous diet, so it’s good to obtain protein from a variety of sources. It’s high in soluble ﬁber, helping to slow down the rate of glucose absorption. This can be especially important in people with diabetes and anyone else trying to maintain balanced blood sugar levels. One Slovenian study in 2001 showed boiled buckwheat groats or bread made with at least 50% buckwheat ﬂour induce much lower postprandial (after-meal) blood glucose and insulin responses than white wheat bread. It’s a potential source of resistant starch, a type of starch that escapes digestion in the small intestine. Resistant starch is often considered the third type of dietary ﬁber because it possesses some of the beneﬁts of insoluble ﬁber and some of the beneﬁts of soluble ﬁber. While most of the starch in buckwheat is readily digestible, the small portion that is resistant (about 4-7%) can be highly advantageous to overall colon health. In addition to the health beneﬁts of consuming buckwheat groats and buckwheat ﬂour themselves, there are even some studies focusing on the health beneﬁts of buckwheat protein isolates and buckwheat ﬂavonoids. And the buck doesn’t stop there. Additional health beneﬁts have been charted in buckwheat protein isolate, thought to be a useful functional food ingredient to treat hypertension, obesity, and constipation. Even on the molecular level, in sprout form, or taken as extracts from either the groat or the hull, buckwheat’s beneﬁts abound. Close examination of buckwheat’s ﬂavonoid compounds (naturally occurring plant pigments in red, purple-red, and purple) reveals groats contain rutin, a particular bioﬂavonoid thought to help control blood pressure as well as to possess anti-inﬂammatory and anti-carcinogenic properties. Click here to learn more details and to reference studies on the health beneﬁts of buckwheat. Finally, we can’t close the health beneﬁts of buckwheat without mentioning it’s a naturally gluten-free whole grain. With the number of gluten-intolerant people continuing to rise, buckwheat can play an important – and tasty! – role in any gluten-free diet. If you or someone you know is gluten-intolerant, we hope you’ll take a moment to visit our Gluten-Free Whole Grains page and then try some of the buckwheat recipes we’re highlighting below. Soba noodles… Galettes (crepes) and blinis (blintz)… Kasha… Pancakes… When you stop and look around at some of the world’s most savory and satisfying foods, don’t be surprised to see buckwheat on the ingredient list. Every culture puts its own spin on cooking with buckwheat, making the recipe or dish wholly their own. For example, soba noodles ﬁrst made an appearance in post-Edo Japan in the late 1800s and can be found in straight-up soba, green tea, or sweet yam ﬂavors. It’s possible to enjoy these noodles in either hot or cold dishes throughout the year, but cold soba noodles with various dipping sauces are most popular in Japan’s hot summer months. Korean buckwheat noodles (naeng myun) are usually a combination of buckwheat ﬂour and potato or sweet potato starch, while the Chinese version are usually solely made with buckwheat ﬂour. Travelers exploring the northern heights of Italy’s Lombardy region can dine on a dish made with Swiss chard, potatoes, and pizzoccheri, a type of short, ﬂat ribbon pasta made with buckwheat and wheat ﬂour. If you’re in the Brittany region of France, you’d best not call your galettes “crepes” – unless you’re already planning a fast get-away to the western-most part of the region, where it’s acceptable to call these wide pancakes by the “c” name. And depending on where you are in the world, you may sit down to blinis made from buckwheat and potato, blintz smeared with butter and jam, or buckwheat blinis rolled around salty caviar with sour cream for dipping. However you serve it, buckwheat makes a nutty and robust addition to any meal. Cooking buckwheat groats comes with only one caution from our WGC Test Kitchens: If you skip the “coat with egg or oil, then heat in a skillet until dry” step in any recipe you use, don’t be surprised when the groats swell to comedic proportions and collapse into a thick, oatmeal-like mass. Limited cooking liquids can also help spare you this surprise, but make no mistake – buckwheat groats, even roasted as kasha, really want to mash together and give up most if not all of their individuality. If attempting a pilaf, tabouleh, or any other dish where individual grains are desired, take the extra ﬁve or so minutes and break out an egg, an egg white, or a little bit of oil. If it ever shows up on Team Trivia night, one hundred pounds of clean, dry buckwheat yields 60 to 75 pounds of ﬂour and 18 to 26 pounds of hulls. There’s an International Symposium on Buckwheat held every three years. It’s organized by the International Buckwheat Research Association (IBRA) and has been held in Slovenia, Japan, Poland, Russian, China, Japan, Canada, South Korea and the Czech Republic since its inauguration in 1980. Most recently, the 11th International Symposium on Buckwheat was held July 19 – July 23, 2010 in Orel, Russia. If the next International Symposium on Buckwheat proves too far for your frequent ﬂyer miles to carry you, there’s also a Northeast Buckwheat Growers Association (NBGA) operating out of Cornell University. Not only does this group disseminate some great information about growing buckwheat, if you’re lucky, you can go on a tour of a real buckwheat ﬁeld! The most recent tour, the 2010 Northeast Buckwheat Field Day, took place in August 2010 and was hosted by the Institute for Sustainability at Alfred State College in Alfred, NY. Thomas Bjorkman of Cornell University led a tour of demonstrations on best management techniques for buckwheat grain production, and nationally known cover crop consultant Dr. Elizabeth Dyck discussed summer cover crops, including buckwheat. Fear not, Canadian growers! You’ve got your own specialized association to turn to for questions on best buckwheat growing, harvesting, and marketing practices – the Canadian Special Crops Association (CSCA). If you live in West Virginia and fancy a bit of a road trip in late September, be sure not to miss the Preston County Buckwheat Festival, soon to be entering its 70th year! Preston High School Juniors begin preparing for the festival when snow still sits on the ground, then the ﬁnalists go on to compete in the Buckwheat Royalty Pageant in May each year, competing for the Festival’s King Buckwheat and Queen Ceres (Roman goddess of agriculture; counterpart of Greek Demeter). And guess who performed at the 2010 Preston County Buckwheat Festival? None other than American Idol ﬁnalist and country singer Bucky Covington! We can’t help but wonder who will perform in 2011! Ever wonder what happens to all those discarded buckwheat hulls? Well, it turns out buckwheat hulls have long been popular as the ﬁlling in homeopathic pillows. They’re also used in heating/cooling packs, which are often scented with lavender or other stress-relieving herbs. Just be careful not to eat that pillow! According to a case study published in The Journal of Allergy and Clinical Immunology back in February of 2009, two patients experienced separate allergic reactions when buckwheat was consumed, after a history of sleeping on buckwheat pillows. Did you know that the character of Buckwheat from The Little Rascals was originally a girl? It’s true! The Buckwheat character ﬁrst appeared as Stymie’s sister in a few shorts back in 1934, when the role was played by two diﬀerent female actresses. Later that year, child actor Billie Thomas nabbed the part – even though Thomas was a boy! The Buckwheat character didn’t become a boy until 1935 when the Stymie character left the series. One of the most famous buckwheats to date is undoubtedly Buckwheat Zydeco. Under his aforementioned stage name, American accordionist and zydeco musician Stanley Dural, Jr. has been entertaining audiences far and wide with his rollicking Cajun music for more than 30 years. Buckwheat Zydeco may be a great musician, but even he can’t claim to have sung about foods made with his namesake. That dubious honor belongs to none other than British band 3 Mustaphas 3, who released their country track titled “Soba Song” (sung appropriately in Japanese, of course) on their 1990 album Soup of the Century. If all that music and dancing makes it hard to fall asleep at night, legendary Danish author Hans Christian Andersen wrote a fable about buckwheat. Granted, it’s more of a cautionary tale about the cost of pride and isn’t really suitable for a child’s bedtime story, but perhaps grown-ups will appreciate the moral of the story.